The 92Y issued a formal apology and a $50 refund after Steve Martin’s talk with Deborah Solomon on Monday, because he was doing all this boring art talk and not talking about himself and his long career in comedy. The Y claims that they were dealing with audience complaints and that the event did not meet the institution’s “standard of excellence.” But now Martin’s hitting back with an op-ed in today’s Times that claims he was so thrown off by a Y staff member sent onstage, mid-conversation, with a note that said, “Discuss Steve’s career,” that he basically wanted to die. And just in case the Times op-ed wasn’t defensive enough, Martin is still tweeting about the incident: “CBS demands refund for my appearance on CBS Sunday Morning,” he joked today. 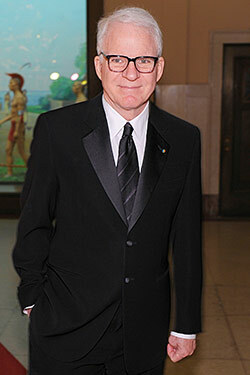 We love Steve Martin — who doesn’t love Steve Martin, besides the crowd at the 92Y on Monday? — but the nature of a live conversation is that you only get one shot. Had Martin actually sung his novel, there probably wouldn’t have been this problem. And while it sounds like the Y was being particularly harsh, this op-ed reads like the equivalent of a text message received after you run into someone who fumbled the stop-and-chat: Your mind’s already made up, and they’re best off just trying again next time.